I've always had a soft spot for Michael Faraday, for any number of reasons, but one of those reasons is that he was a brilliant experimentalist with world-class instincts for investigating the behavior of this strange new phenomenon, and yet he possessed only rudimentary mathematical skills -- something that hampered the broad acceptance of his concept of how electromagnetism worked. And then there was his inveterate bookishness. He came from working class origins: he was the son of an English blacksmith, apprenticed to a bookbinder at 14. Some might have considered this a sucky job, but the young Faraday took advantage of access to all that knowledge, and read voraciously (I was one of those kids who started reading very early, and would compulsively read a cereal box if that's all that was available to me). Faraday was especially fond of reading about the natural sciences. Serendipitously, as his apprenticeship was ending, a friend gave him a ticket to a lecture on electrochemistry by the eminent scientist Humphrey Davey, at the Royal Institution -- not a venue where the young humble-born Faraday would normally be welcomed. Faraday was entranced, and asked Davy for a job. There wasn't a position available, Davy gently told the young man, but shortly thereafter he sacked his assistant for brawling and hired Faraday in his stead. It has famously been said that Michael Faraday was Davy's greatest discovery; considering that Davy discovered the elements barium, strontium, sodium, potassium, calcium and magnesium, that is no mean compliment. Not that Faraday found immediate acceptance in polite British society. He was not considered a "gentleman" by the standards of the day. In fact, when Davy and his wife toured the continent from 1813-1815, Faraday was supposed to accompany them as Davy's scientific assistant -- except when Davy's valet declined to go, too, Faraday was forced to step in, eating with the servants and traveling outside the coach. Faraday endured the poor treatment for the sake of all the stimulating ideas and European scientists he encountered along the way. But it had to rankle a bit. Fast forward to 1820, when news reached England of an exciting new discovery by Dutch scientist Hans Christian Oersted: namely, that electricity and magnetism were not two distinct forces, but the same force: flip sides of the same coin, if you will. Oersted's famous experiment is now a staple of physics classrooms. Take a compass needle mounted on a wooden stand as a magnet and connect it to a battery with a wire. Every time the electric current is switched on, you should see the compass needle give a small jerk. Basically, a moving electric current gives rise to a magnetic field, which is detectable by the compass needle. Faraday was enthralled by this development, and enthusiastically dove into designing his own experiments, hoping to prove that not just electricity and magnetism, but all natural forces were somehow linked -- now an accepted part of physical theory, at least with the cosmology/particle physics crowd, but definitely more of a "fringe" notion back in 1820. "Small science" was the order of the day; this was the golden age of tabletop experiments, and Faraday (like Ernest Rutherford almost a century later) was among its most eminent practitioners. Every physics history book or essay dutifully lists Faraday's three greatest discoveries as a matter of course. First,in 1821, he figured out that electricity could be converted into mechanical motion with the judicious application of a magnetic field (electromagnetic rotation); we have electric motors today because of this effect. In 1831, after a decade of slaving away in his lab, he demonstrated that a jiggling magnet could induce an electrical current in a wire, thereby converting the energy of a changing magnetic field into an electrical current. So we owe our electric generators to Faraday's tireless experimentation. And then there was his discovery of the magneto-optical effect, namely, how light is affected by a magnetic field. Faraday suspected (correctly) that electricity, magnetism and light were all connected, and he concocted an experiment with polarized light to test this hypothesis. The polarization was key: normally light vibrates in all directions at once, but if you pass it through some sort of filter -- a lens, or, in Faraday's case, a piece of heavy leaded glass mounted on a magnet's poles -- the light will vibrate in a single direction. Faraday found that if he turned on an electromagnetic, it would rotate slightly the polarization of the light, proving there was some sort of connection. He didn't have the math to prove it theoretically, but James Clerk Maxwell did, and Maxwell's equations of electromagnetism are now a staple of introductory physics classes worldwide. There's a reason light is synonymous with electromagnetic radiation among modern scientists. 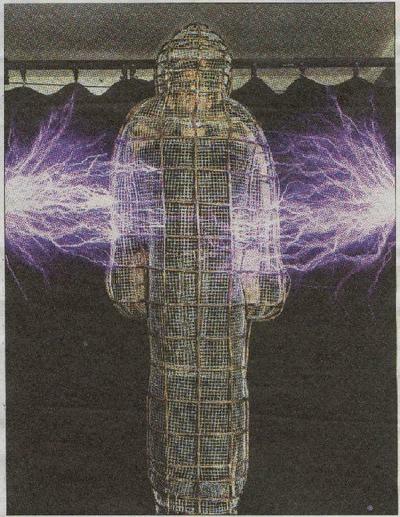 My personal favorite Faraday-related experiment is called a Faraday cage (also known as a Faraday shield), an enclosure specifically designed to exclude electromagnetic fields. Faraday built the first one in 1836 to demonstrate his assertion that the charge on a charged conductor travels along the exterior surface and doesn't influence anything enclosed within it. It's essentially an application of "Gauss's Law": since like charges repel each other (opposites attract), electrical charge will "migrate" to the surface of a conducting form, such as a sphere. You can see a simulation of a typical Faraday cage here. Faraday's 19th century version was an entire room coated with metal foil; he built it himself. Then he blasted the walls with high-voltage discharges from an electrostatic generator, and used an instrument called an electroscope to prove that no charge was present inside the actual room. -- basically a hollow conductor. But the principle applies to such mundane objects as your car: if you're inside and your car and it's struck by lightning, you'd have a pretty good chance of surviving. Don't believe me? Well, Richard Hammond of the British TV series Top Gear put this hypothesis to the test; you can watch the video on YouTube here (embedding has been disabled, for some reason). Brave man, that Hammond, putting his life in the hands of physics. Anyway, Faraday also quickly gained recognition as an excellent public speaker. People in early Victorian England were highly interested in the latest scientific discoveries of the day. (They were also just as prone to superstition, though, and Faraday was a staunch opponent to things like table-turning, seances, and mesmerism.) Fellow naturalist William Crookes described Faraday's lectures thusly: "All is a sparking stream of eloquence and experimental illustration." One of his favorite demonstrations is now a simple experiment repeated by schoolchildren everywhere. You can see magnetic field lines -- what Faraday called lines of force -- by sprinkling iron filings onto a sheet of paper held over a bar magnet. The filings align themselves within the magnetic field, so we can "see" the patten normally invisible to us. "Indeed, all I can say to you at the end of these lectures (for we must come to an end at one time or other) is to express a wish that you may, in your generation, be fit to compare to a candle; that, in all your actions, you may justify the beauty of the taper by making your deeds honourable and effectual in the discharge of your duty to your fellow-men." On August 25, 1867, the flame of Faraday's life was snuffed out; his (physical and mental) health had been deteriorating for a good 20 years by then. But his gifts keep on giving, all these years later. And Christmas seems a particularly apt time to honor the man. Orlando, Florida, is best known as a family vacation destination thanks to the megacomplex of Disney World, but last week both locals and out-of-towners had another option for wholesome "edu-tainment": a Plasma Science Expo, held in conjunction with the annual meeting of the American Physical Society's Division of Plasma Physics (DPP). This is the second time (at least) the DPP has done something like this, and once again it was hugely popular. The event ran for two days, and offered loads of hands-on activities and demonstrations to teach the Orlando populace about this ubiquitous fourth state of matter known as plasma. I should point out, for non-physics types, that this is not the blood-related plasma we hear about on various TV forensics shows, but a cloud of gas that becomes "ionized," i.e., the gas is heated to the point where the electrons are ripped free of atoms and molecules, making the gas highly conductive, just like certain metals. Jen-Luc Piquant is still mourning having missed out on making her own impressive lightning arc, or manipulating a glowing plasma with magnets. We hope Orlando residents appreciated the opportunity in our stead (grumble, whine). It's the conductance capability of plasmas and the similarity to certain metals that make plasmas attractive as an alternative material for the antenna of the future. The 1500+ DPP attendees heard all about it from Igor Alexeff, a professor emeritus of the University of Tennessee and currently chief scientist of a small start-up company in Brookfield, Massachusetts called Haleakala R&D. (You can find a press release on this and several other DPP session topics here.) He's developed a series of prototype plasma antennas that are, per the meeting press release, "stealthy, reconfigurable, and jamming-resistant." Nor is Haleakala the only company working to develop a viable product: there's a British company called Plasma Antennas in Oxford, England, and a strong research effort underway at Australian National University, for example. We're all familiar with conventional metal antennas because they're everywhere: in our satellite dish, on our cell phones, atop radio transmission towers, built into our laptops, etc. Most of us rarely stop to think about how all this wireless connection really works. An antenna is just a conductive, solid metal wire sized in such a way to emit and receive electromagnetic radiation at one or more selected frequencies -- usually in the radio end of the spectrum (which is actually a pretty broad range). Everything vibrates at a natural resonant frequency, and an antenna exploits this effect to transmit and receive electromagnetic waves at a selected frequency. Basically, the energy of the incoming wave couples to the tuned structure, just like those old Memorex commercials where Ella Fitzgerald shatters a crystal wine glass with her voice. She can do it because she sings and holds a note that resonates at the natural resonant frequency of the glass. (Admittedly, they cheated a little and amplified the decibels, but you could call that artistic license.) You "tune" a simple dipole antenna, for instance, by splitting the metal wire or rod into two equal arms insulated from each other. The basic rule of thumb is that its total length should be half the wavelength of the desired incoming signal wave you wish to receive. Which is why a transmission antenna on a radio tower (680,000 Hz) might stand 361 feet, while your 900 MHz cell phone is only about 3 inches. Metal antennas have withstood the test of time because scientists really haven't found anything that works better, once all the technological, economic, and practical use parameters are figured into the equation. But there are some niggling drawbacks to metal antennas, like "ringing" and vulnerability to interference, not to mention a pronounced lack of "stealthability"; plasma antennas can address those issues. 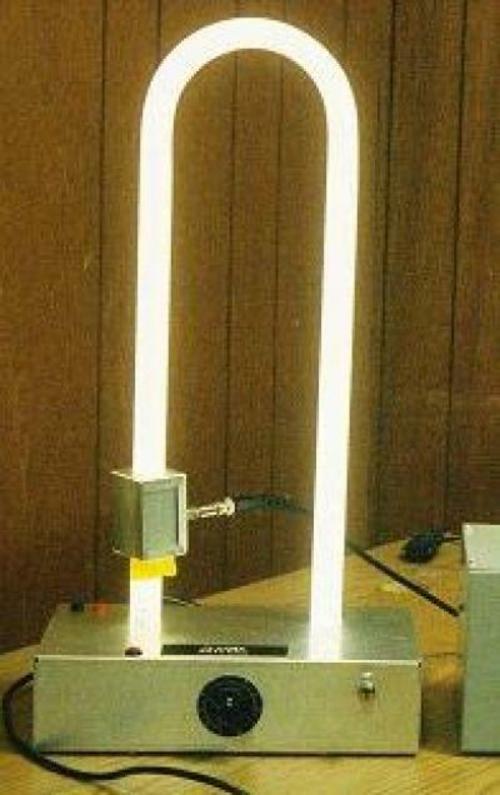 A plasma antenna replaces the metal wire conducting element of a standard antenna with ionized gas enclosed in a sealed glass or ceramic tube: argon, neon, helium, krypton, mercury vapor, or zenon, to name a few gases that have been used in experiments to date. Apply a voltage at a radio-wave frequency to the tube, and you get that all-important coupling effect, resulting in the gas inside becoming ionized. Voila! You've got yourself a working plasma antenna! We mentioned earlier that plasmas have very high densities of electrons, ergo, they are excellent conductors. But they only conduct when the voltage is turned on, unlike metal antennas, which conduct all the time. This means that once you turn off the voltage that creates the plasma in the first place, the substance reverts to a neutral gas. The "antenna" essentially disappears, until you turn the voltage back on again. Now you see it, now you don't. Behold, the Amazing Vanishing Antenna! Perhaps this sounds like a bad thing, but depending on the application you have in mind, it's actually a huge advantage -- for, say, US Navy ships keen on avoiding detection by enemy radar. A regular metal antenna will backscatter any incoming radar signals, giving away the ship's presence and enabling a potentially hostile craft to pinpoint its location. In times of warfare, this is very bad. So it's not surprising that the US military is keenly interested in developing plasma antenna technology. Ships using surface wave radar also often experience problems with the high metal masts installed on board, since they can interfere with each other. Conventional metal antennas pick up interfering signals quite easily, along with noise bouncing off nearby objects. The fact that a plasma antenna ceases to exist when it is turned off and not in use significantly reduces this type of interference. Metal antennas also tend to "ring" because they continue to radiate energy even after the incoming energy stops; the oscillations need to die down. This is especially problematic for short-range ground penetrating radars used in petrochemical and mineral exploration. Thanks to their rapid switchability, plasma antennas don't ring. That on/off switching ability also reduces a plasma antenna's vulnerability to "jamming," a common military counter-measure. It involves deliberately confusing the radar signal by hitting it with intense signals at just the right frequency to make its readings unreliable. There's a nifty example of this kind of thing in Nature: Bats hunt and navigate by emitting ultrasonic pulses and using the returning echoes to determine the location, speed and distance of nearby objects or prey. But certain insects have evolved a kind of frequency jamming ability to disorient a hungry bat. I wrote previously about the big brown bat's unique strategy for protecting itself against jamming. Although they prefer higher frequencies, when something jams their preferred range, the bats shift down to lower frequencies to compensate. Both sonar and radar systems are vulnerable to this kind of jamming; they just use different frequency ranges (ultrasound versus radio). And since the US military relies heavily on both these technologies, they are keenly interested in anything that can reduce that vulnerability. Some scientists are studying the big brown bat in hopes of figuring out how to combat jamming in the ultrasonic frequency range; those interested in combating radar jamming are looking to things like plasma antennas. "Plasma antennas have a high frequency cut-off that can be adjusted electrically," says the DPP press release. "Thus, a plasma antenna can be transmitting and receiving signals while intense incoming high-frequency signals pass freely through it without interacting." Loose translation: you can configure a plasma antenna to be receptive to certain frequencies while blocking out others. Plasma antennas boast terrific reconfigurability thanks to the development of so-called plasma "windows" -- again, something made possible by the fact that the plasma antenna "disappears" once it is turned off, or its electron density becomes too low for efficient conductance. Plasma windows are "apertures," or areas around the antenna's surrounding plasma "blanket" that "open" when the electron density in the plasma is lowered or turned off entirely, making it transparent to antenna radiation. The "windows" will "close" when the plasma density becomes high enough again to reflect antenna radiation well. One window creates a single antenna "lobe," while multiple windows can create multiple antenna "lobes." So you can "tune" your plasma antenna to whatever frequency you wish. That's another huge advantage, because one plasma antenna can perform the same function as several conventional metal antennas. Either you can reduce the number of antennas you need, cutting down on clutter and weight, or you can exploit this feature to build an array of many small plasma elements that the user could reconfigure simply by turning one (or more) of the various elements on or off. The various windows can even be opened and closed in a particular sequence to steer the antenna beam. Alexeff is currently developing a "smart" plasma antenna that essentially steers the antenna beam 360 degrees to scan a given region for transmitting antennas, then locking onto that signal -- much like your built-in wireless connection in your laptop scans the vicinity for the strongest wireless network signal. An array of such smart plasma antennas, when coupled with cutting-edge signal processing software, could maximize signal strength and reduce interference of signals from cell phone towers. This means fewer dropped calls and less "Are you still there? Can you hear me now?" moments for cell phone users everywhere. That steering mechanism could be handy for consumers, too. Figure out how to control a miniaturized plasma antenna array with your wireless laptop, and it may one day be possible to share your computer data wirelessly with just one other user in a crowded room filled with wireless laptop users. You'd just need to close or create "windows" as needed in order to direct the signal to your targeted user. If one didn't understand the underlying science at work, that last bit would sound suspiciously like mental telepathy: you know, the ability to direct your thoughts in such a way that only the intended recipient can "hear" them. There is, needless to say, no scientific basis for such a thing, or for its partner in Pseudoscientific Crime, telekinesis. This is something I discussed at length in one of the chapters in The Physics of the Buffyverse: for starters, electromagnetic brain waves aren't remotely powerful enough to send a strong enough signal to reach a distant recipient, even assuming you could focus the mental signal like a laser beam -- or "steer" it to one's intended target. The upshot is that unless a telepathic (and/or telekinetic) person had a means of amplification, not to mention embedded implants to serve as transmitter and receiver, plus that all-important directivity (i.e., "steering ability), such a feat is quite frankly impossible. Sorry if that bursts anyone's bubble. I know, I know, the idea of mental telepathy is so very seductive, but wishful thinking does not good science make. The world is not magic, remember? That said, science offers something better than magic. Mental telepathy might be a silly notion, but the concept has inspired some pretty exciting new technology. Researchers really are experimenting with implanted computer interfaces, such as the folks at Duke University who outfitted macaque monkeys with the things in 2000 so the monkeys could move a robotic arm from a remote location, or the Emory University researchers who implanted a transmitting device into the brain of a stroke patient, linking the motor neurons to silicon so he could move a cursor on a computer monitor just by thinking about it. Plus, we have just learned -- courtesy of Greg Laden -- that some wacky researchers at the University of Arizona have built robots driven by the tiny brains of moths. Wow. That's some pretty awesome stuff right there. Add in breakthroughs like the configurability, switchability, and directivity potentially offered by plasma antennas, and one day we might not have telepathy and telekinesis, per se, but the technological equivalent. And it will have nothing whatsoever to do with magic. We have not been slacking off on blogging, truly we haven't -- we've just been doing it over at the official blog for the 2007 Industrial Physics Forum all week long. I missed writing an official post for Monday's big "blog for the environment" movement, but as it turns out, I've been learning and blogging all week long about global warming/climate change, the global energy crisis, and the latest advances in alternative energy sources and mitigation strategies. I should get bonus credit! It's been intense: 2-1/2 days of non-stop sessions with blogging in between. We're feeling a bit frazzled and exhausted after three 16-hour days. Also a bit depressed, since that whole global energy crisis? It's big-time serious. And we're running out of time. Fast. Anyway, to give you an idea of what we've been up to, here's the titles and first paragraphs of the seven IPF posts so far (there'll be one or two more on Friday.) Click on the link to read the entire post. UPDATE: Stefan at Backreaction has an excellent post up about Nakamura's recent pioneering work on blue LEDs. Jen-Luc sez check it out! "Busy Old Fool, Unruly Sun..."
Summer's last gasp is upon the DC area. It has been particularly hot and humid of late, the atmosphere heavy with collected moisture, and the weather pundits have been predicting thundershowers for days now. A thunderstorm would be a blessed relief. So Monday night, on the stroke of midnight, I was thrilled to hear a portentous KA-BOOM! Except it wasn't a portent of the much-needed thunderstorm. It was the ceremonial blasting of a portion of the old Wilson Bridge in Alexandria, Virginia, mentioned in an earlier post. I'd forgotten all about the scheduled demolition. Jen-Luc Piquant was a bit more on the ball; she watched the whole spectacle from Cyberspace, and even brought back this video footage of the event itself, courtesy of the Washington Post. Frankly, it was a bit disappointing. The explosion was more like sputtering fireworks, and you can barely see a thing. Apparently they only detonated the one segment of the old bridge to avoid further antagonizing local residents, who have been complaining about the constant dust and noise; plus, midnight is way past their bedtime. Seattle, on the other hand, is a city that knows how to conduct a demolition, as evidenced by this classic video clip of the 2000 blasting of the old Kingdome. Sure, the resulting dust cloud rose 500 feet and blanketed nearby Pioneer Square. Did people complain? Okay, some of them did. But others reveled in the dust storm, adequately equipped with gas masks and such. Destruction became a downright festive event. But I digress. The point is, where's a refreshing spot of thunder and lightning when you need one? The Weather Gods had no compunction about dropping vats of rain onto the DC area on the evening of July 4th, for instance. The accompanying thunder and lightning delayed the national fireworks display. It also delayed my much-anticipated flight to Buenos Aires by 12 hours because -- I was horrified to learn -- our aircraft had been struck by lightning as it sat there on the tarmac, minding its own business, awaiting its turn at our assigned gate. It's an incredible image, one that might give anyone pause about hopping into an airplane anytime soon, but I felt better after reading up about the underlying science of thunder and lightning on the NLSI Website, and encourage others to browse some of their pages, too. Apparently planes can handle a lightning strike just fine, thanks to all the safety precautions that have been in place for more than 30 years. Passengers might see the flash, and hear the thundering boom, but generally the aircraft will fly through the flash, and the current will travel along the highly conductive aluminum surface. As long as there are no gaps in this conductive "path," the electrical current from the lightning will never have much of an impact, beyond the occasional temporary flickering of lights, or perhaps some short-lived radio interference on the instrument panel. The same thing is true of cars, too. If you happen to be sitting in a car when lightning strikes it, you'll probably be okay, as long as you don't stick your hand out the window to check and see if it's "still raining." The current will simply travel along the metallic exterior of the vehicle. In essence, both the aircraft and the car act like a Faraday cage (also known as a Faraday shield), an enclosure specifically designed to exclude electromagnetic fields. The British scientist Michael Faraday built the first one in 1836 to demonstrate his assertion that the charge on a charged conductor travels along the exterior surface and doesn't influence anything enclosed within it. It's essentially an application of "Gauss's Law": since like charges repel each other (opposites attract), electrical charge will "migrate" to the surface of a conducting form, such as a sphere. You can see a simulation of a typical Faraday cage here. Faraday's 19th century version was an entire room coated with metal foil; he built it himself. Then he blasted the walls with high-voltage discharges from an electrostatic generator, and used an instrument called an electroscope to prove that no charge was present inside the actual room. So lightning is a pretty powerful phenomenon, and despite its familiarity, there's a lot about it that scientists still don't quite understand -- things like ball lightning, for instance. There's a decent primer here about how scientists think lightning works, even though they're still a bit fuzzy on some of the details. And we've figured out that thunder is basically the audible pressure wave produced by lightning -- specifically, the sudden rapid expansion of super-heated air in the vicinity of the path of current. The delay between seeing the flash and hearing the thunder occurs because light travels faster than sound. But the fact that it's familiar doesn't make it any less impressive; I still thrill to the experience of a sudden summer thunderstorm, even if it means I get soaked should shelter not be close at hand. That sense of wonder has always been the human response to thunder and lightning throughout history. Most cultures have some version of a thunder god, with references found in the Koran, in Norse mythology, in Hindu pantheism, in Bantu tribal lore, and among the Navajo Native Americans. In Greek mythology, Zeus was the god of thunder, although Socrates, for one, wasn't buying it, declaring (more or less correctly) that the sound of thunder wasn't evidence for Zeus but for a "vortex of air." Our more modern understanding of electricity (and magnetism -- the two are essentially flip sides of the same coin) began in the late 1500s, when William Gilbert, the court physician to Queen Elizabeth I, rubbed amber to produce a static charge. In 1745, a Dutch physicist named Pieter van Musschenbroek invented the Leyden jar -- little more than a glass jar partially filled with water, with a conducting wire projecting from its cork. It was an early form of capacitor, a device used to store electrical charge. (Scientific progress has its price: Van Musschenbroek nearly electrocuted his best friend during the first successful test run.) The ability to produce and store electrical charge led to the rise of popular "electric magic shows," which eventually found their way to the US -- specifically, Philadelphia, where the electrical phenomenon piqued the interest of the local postmaster in 1746. The postmaster's name was Benjamin Franklin. In addition to advancing scientific understanding about the nature and behavior of lightning -- and therefore, by extension, of electricity -- Franklin also invented the lightning rod, and a device called lightning bells, which would jingle whenever lightning was in the vicinity of his house. (It drove his wife to distraction one particularly storm-laden summer.) And he used his newfound knowledge to indulge in some amateur pyrotechnics, via the aptly named "Thunder House." It was a wooden structure with a can inside filled with flammable gases, connected by wire to a metal weather vane on the roof. He used a Leyden jar to create a spark, which traveled from the roof to the can, igniting the gases. Wood House Go BOOM! In fact, the force of the explosion was sufficient to quite literally blow the roof off that sucker. For the grand finale, Singh and Wiseman wheeled in the "coffin of terror", a narrow sarcophagus made of chicken wire. Singh got inside, and was subsequently "zapped" by two million volts of electricity. Miraculously, he emerged unscathed. Okay, not so miraculously -- the coffin of terror is a Faraday cage. The lightning hit the cage, but the charge only flowed across the metal surface. So long as Singh didn't poke a finger through the chicken wire, he was safe from harm. Still, it's gotta be a nervewracking stunt -- the Soho Theatre needed 12 million pounds worth of insurance to stage the show -- and Singh generally closed his performance with the words, "Thank god for the laws of physics!" One might be excused for concluding that Simon Singh is just plain crazy. He certainly has some serious cojones. Not many people would be willing to put so much faith into the laws of physics... or would they? That's the difference, you see, between "magic" or religion, and science: the former really must be taken on faith, dwelling primarily in the realm of belief. Science rests on centuries (at this point) of tried-and-true experiments, replicated over and over again, each time with the same result. This reproducibility, amassed over hundreds of years, is what gives Singh the confidence to step into the coffin of terror and risk his own skin, performance after nail-biting performance. That's the awesome power of science. We here at Cocktail Party Physics salute Singh, Franklin, Faraday, Edison, Tesla, and all the other pioneers of electromagnetism, with not one, not two, but three physics cocktails (four if you count two versions of the same one). First, there is the High Voltage: combine 6 parts tequila with 3 parts peach liqueur, and 1 part lime juice. Mix it all together in a shaker, pour into a chilled glass, and enjoy. Next we have two versions of a drink called Thunder and Lightning. Version 1.0 is pretty standard, as cocktails go: Mix 1/2 ounce of Rumple Minze with 1/2 ounce of Bacardi 151 proof rum in a shaker, pour into a glass, and serve. It's a bit more lethal than it sounds. More intriguing is Version 2.0, which calls for 1-1/2 ounces of brandy, 1 teaspoon of powdered sugar, and 1 egg yolk (huh?). Shake all the ingredients with ice, strain into a cocktail glass, and serve. And finally, we have a pyrotechnic little concoction called the Combustible Edison, which we're adding to our permanent sidebar "menu". In a shaker filled with cracked ice, combine 1 ounce of Campari with 1 ounce of fresh lemon juice. Shake and strain into a chilled cocktail glass. Then heat 2 ounces of brandy in a chafing dish. Once the brandy is warm, ignite it and pour into the cocktail glass. Cocktail Go BOOM! Friends Impressed! Host Has Made Fire! And Fire = Pretty! See? A simple cocktail can bring out the awestruck caveman lurking deep within all of us.